Technology and telecommunications groups opposed to a federal mandate that cars automatically communicate with each other are hoping the proposal is an early victim of President Donald Trump’s regulatory clampdown. The Department of Transportation rushed to publish a draft rule in the final days of the Obama administration that would mandate all new cars and light trucks be equipped to transmit data to other vehicles to warn their drivers of potential collisions. The department and automobile manufacturers have been laying the groundwork for such a rule for more than a decade, with millions of dollars in testing indicating that the radio-based technology could immediately save lives. The catch: the draft vehicle-to-vehicle, or V2V, rule would depend on communications technology developed by the auto industry—drawing the ire of some tech, telecom and free-market industry organizations. Some have pushed back against mandating an aging technology while alternative emerging technologies are developing rapidly for autonomous vehicles and faster wireless. Others, such as the Wi-Fi Alliance and NCTA-The Internet & Television Association—which represent companies like Charter Communications Inc. and Comcast Corp.— have long supported sharing the airwaves affected by the rule and likely stand to benefit from a rollback. Now these groups hope Trump’s freeze on Obama administration rulemaking efforts, and his mandate that agencies scrap two regulations for every one issued, will advantage them in their fight to block the rule. For now, industries on all sides of the debate are waiting for new Transportation Secretary Elaine Chao to bring clarity to the rule’s review status in light of Trump’s executive orders. 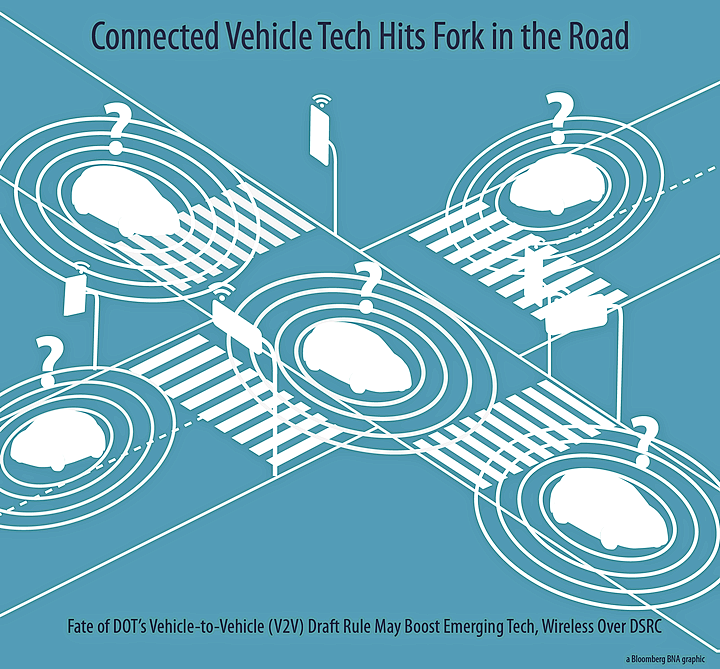 The DOT spent more than a decade researching and developing DSRC technology, called dedicated short-range communications, for V2V communications. DSRC, which works in a similar manner as Wi-Fi, can warn drivers of potential crashes by sending information about the speed, direction and brake status of nearby vehicles. Cars would communicate with one another over airwaves the Federal Communications Commission has reserved exclusively for V2V. The draft rule could save up to 1,365 lives each year by 2060, when the technology is fully deployed, according to the National Highway Traffic Safety Administration. The Transportation Department also estimates that V2V tech, when combined with yet-to-be-deployed vehicle-to infrastructure communications systems on bridges and traffic lights, for example, could prevent or lessen the severity of 80 percent of all car crashes involving non-impaired drivers. Over 32,500 people were killed in car crashes in 2014 alone in the U.S., NHTSA data shows. If the rule is finalized, automakers would be required to install DSRC-compatible V2V technology in new cars beginning in 2021. The rulemaking sparked controversy long before Trump took office. While traditional automakers supported the mandate, cable and wireless trade groups and lobbyists have slowed its progress, arguing that its spectrum band should be open for unlicensed sharing. As Silicon Valley increasingly enters the automotive space with self-driving vehicles, some tech voices have joined free-market think tanks in expressing concern over the government mandating any single technology, particularly given lingering questions over DSRC’s privacy and cybersecurity strengths and the emergence of new safety technologies. “It sounded a lot better 10, 15 years ago when no one was talking about automated vehicle technology,” Marc Scribner, a research fellow at the Competitive Enterprise Institute, told Bloomberg BNA, referring to the draft V2V rule and DSRC as currently envisioned. Scribner and other V2V-mandate opponents see an opportunity in Trump’s rapid-fire executive orders on freezing and repealing regulations. Trump has said he’s looking to rollback 75 percent of regulations in order to stimulate business growth. Republican House members quickly fell in line, passing two bills aimed at reining in regulations and targeting other last-minute rules passed under former President Barack Obama for repeal. The current deregulatory climate may make it less likely that DOT will push the Obama administration’s draft rule over the finish line. Still, Trump has not directly criticized the V2V rule. The auto industry has come out in support of the rule, and Ford Motor Co. CEO Mark Fields and General Motors Co. CEO Mary Barra are among Trump’s business advisors. “This has broad industry support, it’s something the auto industry has been seeking for some time,” Hilary Cain, Toyota Motor North America Inc.'s director of technology and innovation policy, told Bloomberg BNA. A central benefit of the draft rule is that it would ensure communication between all makes and models of vehicles, Cain said. The communications technology would be quickly deployed and interoperable between manufacturers over time, she said. “So Toyota vehicles today can talk to Ford vehicles today, and Ford vehicles tomorrow can talk to Toyota vehicles tomorrow,” Cain told Bloomberg BNA. U.S. Rep. Debbie Dingell (D-Mich.), whose congressional district includes part of the Detroit metropolitan area, said Feb. 2 at a House Energy and Commerce Committee hearing that she hoped the work of the DOT and FCC on the V2V rule and spectrum sharing would continue. “I hope this continues to move forward and we keep finding common ground,” Dingell said. Still, other lawmakers have expressed concern about the capability of DSRC technology to protect drivers from hackers. Sens. Edward Markey (D-Mass.) and Richard Blumenthal (D-Conn.) have asked NHTSA and the FCC to ensure robust privacy and security protections are established. Cost, meanwhile, is one weapon in the rule opponents’ arsenal. Critics say the auto industry and NHTSA have become too wedded to an aging technology that carries an enormous price tag. In fact, given that the industry and DOT have poured millions of dollars into DSRC research and testing, some in the industry have vowed to install the technology regardless of the Trump administration’s move on the mandate. The total annual costs to comply with the mandate 30 years after the rule’s launch range from $2.2 billion to $5 billion, according to 2016 NHTSA data. Consumers can expect to pay about an extra $300 per vehicle equipped with DSRC technology, the data show. For Scribner and others, the return on investment doesn’t justify the V2V rule’s costs. DSRC technology will take four decades to fully penetrate U.S. roads and— even then— it will only warns drivers of potential crashes; distracted or drunk drivers may not benefit to the same degree, Scribner said. Meanwhile, artificial intelligence, camera technology, sensors and radar, which are already being used in autonomous vehicle development, improve vehicle safety and don’t require cars to be connected to each other, Paul Brubaker, president and CEO of the Alliance for Transportation Innovation, a non-profit think tank, told Bloomberg BNA. Moreover, the V2V rule is slated to take effect in 2021, the same year that several automakers have promised fully autonomous vehicles. Although autonomous vehicles can be deployed without V2V technology, industry stakeholders agree “it would not be possible to optimize the benefits of automated vehicles without V2V,” NHTSA officials wrote in a fact sheet released with the draft rule. Current technology, such as sensors or lasers, which use visible light to detect hazards, cannot “see” around corners or through objects like radio-based technology, thus limiting their ability to prevent collisions. For example, Tesla Motors Inc. blamed the May 2016 crash of one of its Model S vehicles on the failure of the driver and the car’s self-driving features—which are not equipped with V2V tech—to distinguish the light of the sky with the light coming off a white truck in its path. But radio-based communication between the two vehicles conceivably could have warned the driver of the impending crash, some V2V proponents say. The Wi-Fi and telecommunications industries are set to benefit from a possible V2V rule rollback. They have long argued the 5.9 GHz spectrum reserved by the FCC since 1999 for vehicle communications should be open to unlicensed sharing. Auto and safety groups pushed back, arguing that testing was needed to determine if sharing the band would risk interference with safety-critical communications. The FCC had promised to complete testing of spectrum sharing before Obama’s term ended. But now the agency is under Republican control, and it’s unclear how that change in leadership may affect the outcome of the testing. Telecommunications groups have also pushed for use of cellular alternatives to DSRC, such as LTE-V or 5G—the next generation of high-speed wireless technology. Cellular groups and carriers such as 3GPP and IEEE have already experimented with standardizing V2V communication based on existing cellular networks. “Some in the industry believe that 5G—despite the fact that it is still in early testing stages and likely won’t be ready to be deployed until after 2020—is better positioned than DSRC to be future-proof, given that V2V will not be ubiquitous for quite some time,” Elliot Katz, co-chair at DLA Piper’s connected and self-driving car practice, told Bloomberg BNA. Still, Cain and other supporters of DSRC argue that these alternatives would need to be developed and tested, which could take years. “There’s no communication technology that exists today that can support V2V communication for collision-avoidance purposes,” Cain told Bloomberg BNA. Despite NHTSA’s support of DSRC, the V2V rule only mandates that communications between vehicles be compatible with DSRC, and some stakeholders are waiting for a groundswell of support for 5G to surface during the agency’s 90-day comment period for V2V, which began Jan. 12 and is scheduled to end April 12. A NHTSA spokesman did not comment on the status of the V2V rule or its review by the new administration. Chao, who was sworn in Jan. 31 and served as deputy transportation secretary under President George H.W. Bush, is something of a wild card on V2V. Chao’s nomination was generally met with enthusiasm from the auto and tech industries, and she’s already been urged to continue to make progress on the proposed V2V rule by Sen. Gary Peters (D-Mich.), a prominent voice on auto industry interests. During her Senate confirmation process, Chao indicated she would take a light regulatory touch while still emphasizing safety. But she didn’t speak in detail about V2V or DSRC. Meanwhile, V2V advocates can try to make the case that the rule will improve public safety while stimulating the economy through innovation, something Trump could be hard-pressed to oppose. With assistance by Lydia Beyoud.